This Parisan Browning Essence finally arrived from Melbourne to enable me to make this Kek Belacan. Thanks to my dear friend, Chan who carried it all the way. Truly, it did make my cake looked very much like Belacan. Follow recipe from Secretive Cake but replace the caramel sauce aka dark soya sauce with Queen's Parisan Browning Essence. My paternal grandmother used to cook an egg dish which is quite similar but not quite as her recipe is just eggs and ground pork. I remembered she used duck eggs instead of chicken eggs and had to put in alot of pepper to muffled the 'egginess' of the duck eggs. This vietnamese recipe has more ingredients and putting the egg yolks on top of the loaf gives this dish so much more appeal. Reserve 2 egg yolks and beat remaining eggs and egg whites. Mix all remaining ingredients into beaten eggs. Pour mixture into a large heatproof (flameproof) bowl and steam covered over medium heat for about 25 minutes. Beat reserved egg yolks and pour over steamed egg mixture. Steam for 5 minutes. Garnish with coriander and serve hot with steamed rice. To test if the dish is cooked, simply insert a bamboo skewer into the middle of the meatloaf and if the skewer come out clean, the dish is cooked. Knowing Renee's friends loved cake and a birthday party without cake will not be the same, so, there was cake - Cupcakes for the Princesses. The cupcakes were vanilla flavored with cream cheese frosting. Line a 12 cup muffin pan, with cup cake cases. Beat with an electric mixer for 2 minutes, until light and creamy. Allow to cool for a few minutes and then transfer to a wire rack. Allow to cool fully before frosting. Combine all ingredients in the bowl of a stand mixer, fitted with a paddle attachment, and beat at low speed until sugar is incorporated. Pipe the frosting on to the cupcakes. Renee turned seven on March 23rd and this year her theme for her party was Princess and she requested Cinderella. Instead of the usual birthday cake, i made her Cinderella from konnyaku or rather, the skirt only was from konnyaku. The top skirt was made from a jelly mould and the bottom skirt was a bundt cake pan. Mix the konnyaku jelly powder and sugar. Bring the water to the boil and slowing add in the jelly powder and sugar mixture. Stirring until all the sugar is dissolved and the mixture is clear. Separate mixture into 3 portions, color one portion light blue, dark blue and white which has condensed milk added. Make the skirts by layering the bundt pan and jelly mould with alternate colors. When chilled, remove from moulds and assemble. Top with a Cinderella doll. Ensure layers are well set before adding the next layer. Ensure the mixture for the layers are alway hot so that it can adhere to the set layer. One of the really missed food for me is the Mud Crab, luckily there is the Dungeness Crab. They are just as good, huge but expensive but it is worth the price cos the frozen ones have never met my satisfaction. Many commercially cooked crabs (and lobsters) are overcooked. For a perfect crab, plunge it into a large pot of rapidly boiling, heavily salted water or steam the crabs. Cook/steam only until white foam appears at the joints, which indicates the meat is cooked. Remove it from the pot immediately and allow it to cool. How can you choose a meaty crab? As if we have a choice, except for you lucky people who are in South East Asia, you know what i mean, but anyway - most crabs in general should feel heavy for their size. If the shell feels papery, the crab hasn't filled out yet. A Dungeness crab at its prime is dark brown to purplish. Look for dark color. Light-colored arms indicate a crab that has just molted. A goodly amount of water is trapped inside the shell, so if the crab is weighed wet, and that is generally the way it is done,we are paying for water - $5.99 a pound. Keep in mind that meat accounts for about 25 percent of the weight of a whole crab, so to have 1 pound of meat for this recipe, you would have to purchase 4 pounds live crabs. Cook onion and parsley in butter until tender in small skillet. Combine cracker crumbs, mayonnaise, egg, cream, Worcestershire, lemon juice, salt, pepper and hot sauce in large bowl. Stir in onion mixture and gently stir in crabmeat. Shape into 6 patties. Coat with bread crumbs. Cook patties in hot oil until lightly brown, about 3 minutes on each side. Do not flip cakes before it is browned. We had a late lunch, so come dinner, the family did not feel like eating and so i prepared crab cakes and made this tasty, tangy, creamy coleslaw which was a great choice for the sides. Add dressing to the shredded cabbage mixture until well moistened. Refrigerate to chill thoroughly for added flavor. When ready to serve, sprinkle with Hormel Real Bacon Pieces. Which way would you consider the most humane and best method? Studies have been carried out by a number of researchers and universities to determine the most humane method of boiling lobster. Various methods of relaxation techniques were carried out prior to boiling and the lowest number of tail flicks upon insertion into the boiling water was thought to mean that the lobster felt less pain. It was found that the best way to minimize the tail movements of the lobster upon boiling is by placing the lobster in the freezer for a period of 5 - 10 minutes in order to numb the lobster before cooking. I like steaming the lobster, although it require a longer cooking time to steam the lobster, however, the result is better than boiling, giving you a succulent and tasty lobster meat. Once the water is boiling fiercely, place the lobster onto a rack, cover the pot and bring back to the boil. Begin timing once the water is boiling again., steam the lobster for 14 minutes for the first lb of weight and then an extra 3 minutes for each extra lb. A 2 lb lobster will cook in 17 minutes, a 3 lb in 20 minutes. Once the lobster is done, drain immediately and let it sit until it is cool enough to remove the flesh from the shell. Stuffed Pork Tenderloin and blanched green leafy vegetables and drizzle with the sauce from the pork tenderloin. Enjoy with pickled green jalepeno or chilly sauce. Care must be taken not to overcook the lobster, as this will result in tougher and less succulent meat. The lobster is properly done when an antennae comes off easily when pulled gently. The internal temperature of the lobster meat will have reached 180°F (80°C). The green tomalley or liver, which is situated inside the body cavity, will have turned a greenish yellow colour. Which parts of a lobster can you eat? The majority of the lobsters meat is found in the tail and in the two front claws. Smaller amounts of meat can also be found in the legs and in some parts of the body. Parts which should not be eaten, are the shell, the sac behind the eyes, the black vein running through the tail and the green tomalley, although this is debatable, as some lobster eaters claim this to be the best part. Tofu skin also known as dried beancurd, yuba or bean skim, is a Chinese and Japanese food product made from soybeans. During the boiling of soy milk, in an open shallow pan, a film or skin composed primarily of a soy protein-lipid complex forms on the liquid surface. The films are collected and dried into yellowish sheets known as tofu skin or soy milk skin. Because it is derived directly from soy milk, the name tofu skin is technically inaccurate. Due to it slightly rubbery texture, tofu skin is also manufactured in bunched, folded and wrapped forms that are used as meat substitutes in vegetarian cuisine. Tofu skins can be wrapped and then folded against itself to make doù baō (Chinese: 豆包, literally "tofu package"). Marinate dou bao for at least 20 minutes. Cut carrot into 1/2 inch x 2 inches x 1 inch. Cut dou bao into 2 inches strips and wrap it around a piece of carrot. Secure with a toothpick. Heat oil until hot, dust each vegetarian sparerib with cornflour/tapioca flour and drop into hot oil. Tofu is low in calories, contains beneficial amounts of iron and has no saturated fat. It is high in protein and calcium and well known for its ability to absorb new flavors through spices and marinades. Tofu also contains soy isoflavones, which can mimic natural human estrogens and may have a variety of harmful or beneficial effects when eaten in sufficient quantities. Due to its chameleon-like qualities and nutritional value, tofu is a staple of Asian cuisines for hundreds of years. In a shallow bowl or baking pan, combine all ingredients except tofu. Mix well and add tofu, cover, and marinate in the refrigerator 4-5 hours. 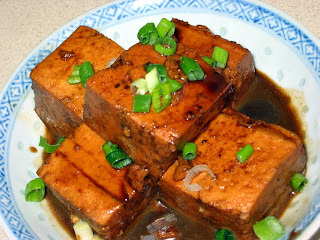 Turn tofu slices several times while marinating. After 4 - 5 hours, remove tofu and pour the marinate into a saucepan. Bring to the boil and add in tofu. Cook until tofu is warm through. Adjust taste and serve with a sprinkle of sesame oil and chopped spring onions. I had a bag of shallots and they were dying on me. No matter how lazy i was, i had to make use of them and besides, i was running out of sambal. So, i made a batch of Garam Assam Paste. The belacan used stunk the house but to me it was aroma of familiarity. I am always in seven heaven when i eat dishes cooked with this sambal. Heat 4 or 5 tbsp oil and fry the sliced tofu until golden brown. Remove almost all the oil that is left and add in the sliced chicken. Add in salt and pepper. Do not move the chicken slices until they are browned. Add in a little oil if you must. Flip chicken over and fry the other sides. Add in the garam assam paste and the fried tofu. Stir to combine. Add in tamarind juice and a little water and cook until chicken is cooked through. Sizzling Crêpes (Banh Xeo) are paper-thin omelets stuffed with shrimp, pork, and bean sprouts, wrapped in lettuce and herbs, and dipped in a sweet-tart dipping sauce. Banh xeo ("bahn SAY-oh") is a popular street snack in Vietnam, especially the south. The name means "sound crepe," and it indicates the sound the batter makes when it hits the hot pan. I wish to visit Vietnam one day and until i do, this recipe will do. Adjust 2 oven racks to the upper- and lower-middle positions and heat the oven to 200 degrees. Whisk the water, rice flour, coconut milk, scallions, turmeric, sugar and salt together until uniform. Add in chopped scallions/spring onions. Heat the oil in a wok/skillet over medium-high flame and add shallots or scallions and garlic. Sauté for 1-2 minutes without browning. Add the shrimp and sauté until the shrimp is cooked through. Add the fish sauce and salt to season. Remove shrimp to a bowl and set aside. Wipe out the wok/skillet (i used the crepe pan) and reheat over medium flame. Add a small amount of oil. Stir the crepe batter well and pour 1/2 cup batter(amount depends on the size of pan) into the wok/skillet/crepe pan. Swirl the pan to coat the bottom. Lay 3 or 4 of the cooked shrimp over one half of the crepe and then sprinkle a small handful of sprouts over the shrimp. When the the middle of the crepe looks cooked through and the edges of the crepe begin to brown, fold the crepe over to cover the filling and slide onto a plate. Hold in a warm oven as you finish the rest of the crepes. Serve the crêpes with the individual bowls of sauce, passing the garnish platter separately. (To eat, slice off a wedge of the crêpe, wrap it in a lettuce leaf, and dip it into the sauce.). Pork Banh Xeo: Substitute half of the shrimp with pork loin or pork belly cut in thin strips. Sauté the shallots and garlic first, then add the pork to cook through, and finally add the shrimp. Vegetarian Banh Xeo: Substitute fried, shredded tofu for the shrimp to make a vegetarian version. Add a variety of mushrooms to give a meaty flavor. Use soy sauce instead of fish sauce. Banh Xeo with Egg: Beat 4-5 eggs and pour a little over each crepe after you add the batter to the skillet, but before you add the fillings. Cover the pan for about a minute to let the egg set, then continue with the filling ingredients. Include some peeled, seeded and thinly sliced cucumber or julienne carrot with the rest of the salad ingredients if you like. Nuoc cham is the all-purpose Vietnamese condiment served with and poured over many dishes. 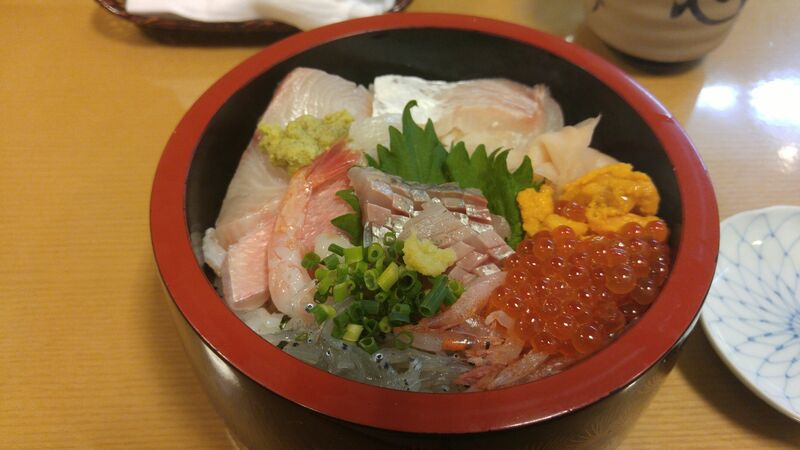 Its salty-sour flavor is wonderfully bright and fresh. Nuoc cham will keep for about a week in the refridgerator. Unlike in Malaysia, my friends are either Chinese, Malay or Indian descent but here, i have made friends from all over the world and that is how my culinary ventures expanded. Not only do we become good buddies, we share our cuisine too. This is the first time that i cook Bun Bo Hue and it was delicious and not difficult to prepare. I do not claim authenticity but this recipe is a keeper for me, sorry no pig's blood and all unusual salads to garnish like banana flower blossom or perilla. The pig's hocks and the Gio were so delicious that there were none left for photo session. Pre-boil the bones, hock, trotters, Beef shanks until the impurity floats on top of the water. Usually 5 to 10 minutes. Drain and rinse the bones, hock and trotters and beef shanks. Put back contents into stockpot with enough water to cover and add in the whole peeled onion, ginger and lemon grass. Bring to the boil and reduce to simmer. Simmer until shank and hocks are tender. Remove shank and hocks and soak in a bowl of hot water for 10 minutes until cool. Add in rock sugar to the stock and continue to simmer until flavorful. When stock is done, strain stock through a fine sieve and add in fish sauce, salt, bun bo hue paste. Add beef balls to the hot stock. Blanch vermicelli according to the intruction at the back of packet. To serve, Put vermcelli in a large bowl, top with pork hocks, beef shank slices, gio and beef balls. Pour hot stock over. Garnish with bean sprouts, thai basil, sliced red cabbage, lime wedges and sliced chilies. Mix pounded chilies into fish sauce and serve on the side.